Every property owner deserves to receive help from a water mitigation company they can trust to implement speedy water damage repairs on a moment’s notice. 911 Restoration of East Dallas is proud to be that restoration company to the Allen community. Due to their vast experience, they are qualified to help owners of both residential and commercial properties. The East Dallas office is open 24/7/365 to take your calls concerning an emergency water damage situation because we understand that a disaster such as a pipe burst, ceiling leak, or sewage overflow, can occur at any time. It is crucial to administer water extractions you as soon as possible, which is why the repair techs guarantee to arrive at your property within 45 minutes of receiving your call, where they will be fully prepared to begin same-day, water damage restoration services in Allen. Customers can be confident in our flood cleanup services, not only because of our many years in the restoration industry, but because we are backed by the Institute of Inspection, Cleaning, and Restoration. Along with being IICRC Certified, the entire 911 Restoration operation is licensed, bonded, and insured for everyone’s protection. So, when you need flood cleanup services that you can trust, call the only restoration company you can trust to give you the peace of mind you deserve. It is essential to the recovery of your property that you seek out water damage restoration services as soon as you can once you have discovered that there has been a leak or flood inside your home or business. The reason that quick flood cleanup services are so vital is due to the destructive nature of water. It has the ability to rot wood and create structural damages, as well as seep into drywall and other porous materials to start a mold infestation. Mold can begin to grow with 24 hours of being exposed to moisture and often it infests areas of the property that are out of sight or challenging to get to, such as underneath floorboards, inside walls, and throughout the ceiling. To make sure that they understand the source of the water damage and mold, the technicians provide property owners with a free visual inspection during which they will check all those hard to reach places. The professionals want to do all they can to prevent you from becoming impacted by another water emergency. If there is a leak from a wall, they will follow that leak to the end, making sure to fix the water leak in the ceiling and mitigating any signs of mold. These comprehensive services will help prevent future instances of water damage and mold growth. Call 911 Restoration of East Dallas when you need help from technicians that care and understand your needs. 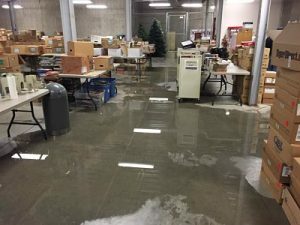 Trusting companies for water damage restoration can be difficult, especially for most people who do not have any idea about how the process works. Fortunately, 911 Restoration of East Dallas makes it easy to receive flood cleanup in Allen, because the technicians walk you through every part of the process. We encourage you to ask questions because making you feel as comfortable as possible is our top priority. Repairing home water leaks do not have to cost you an arm and a leg, and we prove that by consistently offering affordable leak and flood repair services. On top of having competitive prices, we also work with all insurance companies. The staff members realize that many of their customers have not ever filed a claim with their insurance company before, so they will go over your policy and submit your claim for you, so you get the most coverage. We will do whatever we can to make the water damage cleanup process a positive experience. From giving you an estimate for ceiling repairs to conducting raw sewage spill cleanup services, customers can depend on us to take care of everything. Call 911 Restoration of East Dallas at the first sign of water damage and the technicians will turn your water disaster into a Fresh Start! Servicing the cities of Allen, Balch Springs, Casa View, Forney, Garland, Heath, Mesquite, Lawson, Plantersville,, Richardson, Rockwall, Royse City, Rowlett, Sachse, Sunny Vale, Thomaston, Talty, Terrel, Wills Point, Wolcott and surrounding areas.